Tired of traditional radio? Everything you’ve learned to appreciate about HIFI Magazine has been injected into the playlists at HIFI LIVE! Diversity is the key to our special regimen, and the choice of music is sure to reflect that level of excellence. We play the classics – the Rolling Stones, Aretha Franklin, Elton John, the Beatles, Foreigner, Journey, George Michael, Dave Matthews Band, Bon Jovi, Stevie Wonder, Queen, Jefferson Airplane, the Police, Steely Dan, Marvin Gaye, Phil Collins, Whitney Houston, R.E.M., the Pointer Sisters, Luther Vandross, Mariah Carey, Mary J. Blige and more. We play today’s favorites – Adele, Katy Perry, Maroon 5, Taylor Swift, Lady Gaga, Bruno Mars, Rihanna, Coldplay, Ne-Yo, One Direction, Ke$ha, Nicki Minaj, Drake, Green Day, Kings of Leon, Carly Rae Jepsen, Robyn, the Black Keys, Alex Clare and more. We also play the eclectic, the underground, the bubbling acts – My Morning Jacket, Mayer Hawthorne, Scissor Sisters, the Killers, the Strokes, Vampire Weekend, Ledisi, Amos Lee, LCD Soundsystem and more. Everything you love about the ’70’s, ’80’s, ’90’s, the ’00’s. From disco to alt-rock, from reggae to synthpop, from country pop to Top 40 hip-hop, you can count on us to play it. Online all the time. 24/7. NOW MOBILE! Listen to HIFI LIVE! 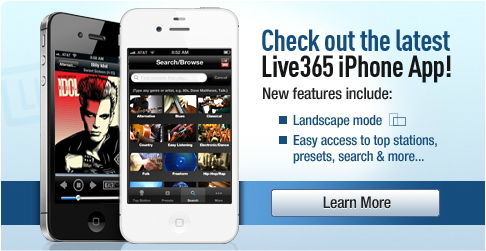 on the go using the LIVE 365.com app*. Available for free on iOs on Android.